These numbers reflect estimated student expenses for the 2019-2020 school year. Amounts will change slightly from year to year, but as the cost of college increases, the scholarship packages will correspondingly increase. Your official financial aid award will be included in a letter directly from Dartmouth. Students who receive funding from external sources can use these funds to reduce the self-help (loan and/or job portions) of their financial aid packages. If the outside funds are greater than the self-help level, the family responsibility can be reduced to the federal level. Dartmouth scholarship is reduced as a last resort to avoid over awarding. Dartmouth College requires all active students, including students not taking classes or on a leave-term to have health insurance meeting specified standards of coverage through either the Dartmouth Student Group Health Plan (DSGHP) or a comparable policy through his/her parent's employer. During the summer months, students may complete the waiver process if the student is covered under a comparable health plan. If the waiver is not received, the student will automatically be enrolled and the cost of the insurance will be charged to the student's account. In addition to the cost outlined above, QuestBridge match students will receive a scholarship for the full cost of the Dartmouth Student Group Health Plan: $3,073 if purchased. If you live a distance away from campus, a travel allowance will be included in your cost of attendance. This travel allowance is another indirect cost that will not appear on your student bill. Travel allowance is determined by state. Students and families must arrange and pay for all travel to and from Dartmouth College. Students reapply for aid each year, submitting updated applications and financial documents. Awards are adjusted only in cases of substantial changes. Match students will have a $0 parent contribution and $0 loans for all four years. Students may request loans to offset costs. The student's standard earnings contribution increases moderately in the upperclass years. Ownership of a computer that meets criteria set by Dartmouth College is mandatory for all students. The cost of a basic computer package in 2018-2019 is $1,450. If you believe you have a computer that meets all of the Dartmouth requirements, there is a waiver process. All QuestBridge match students will receive a scholarship to cover the cost of a basic computer package. Dartmouth College has a long history of providing educational opportunities to talented students regardless of their family's ability to pay. As a member of the Ivy League, Dartmouth awards only need-based financial aid and offers no merit, athletic or special talent scholarships. Dartmouth meets 100% of each student's demonstrated need for his or her four years of undergraduate study. Undergraduate financial aid applicants with total parent incomes of $100,000 a year or less with typical assets will receive a full tuition scholarship and will not have a loan component in their financial aid package. When assessing need, Dartmouth considers income and assets including savings, investments, real estate, and businesses. Dartmouth also considers the family size, number of siblings in college, and any expenses beyond the family's control (high medical and/or dental expenses, required private school expenses, and other unusual expenses). As Dartmouth seeks the most academically promising students, inclusive of families with significant financial disadvantage, we anticipate that many College Match admission candidates will qualify for an Expected Parent Contribution (EPC) of zero and this will remain so throughout a student's four years of College study. Although Federal requirements make it necessary for students to re-file for financial aid for each year beyond the first-year, QuestBridge Scholars should anticipate receiving robust financial aid awards, including off-sets for increases in attendance costs, for their sophomore through senior years. A typical financial aid package for a family with a zero EPC will include student employment of $2,450; any Federal and state grants the student may be eligible to receive and sizeable Dartmouth scholarship assistance. Dartmouth expects a student contribution from summer earnings (or leave-term earnings in subsequent years), currently $1,000. Dartmouth's summer/leave-term earnings contribution is re-evaluated each year. In addition to the summer earnings requirement, students are expected to contribute annually 20% of their reported assets (cash, savings, checking, investments, and real estate). Dartmouth College is need-blind and meets 100% of a family's demonstrated need. 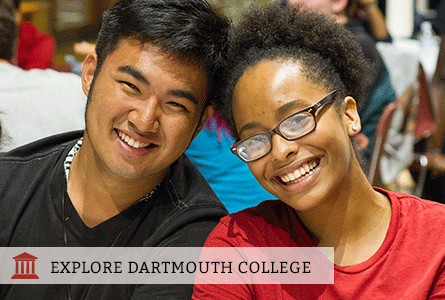 Learn more about financial aid at Dartmouth. Average annual scholarship for the Class of 2021 was $49,358. Use Dartmouth's Net Price Calculator to estimate the financial aid for which you are eligible.